If there's one thing that fans have been looking forward to for a long time, it's the possibility that Jon Snow would eventually ride a dragon in Game of Thrones. But is there a reason why Jon chose not to get on Drogon's back in Season 7? Some key detail from the books may have revealed why it didn't happen in the previous year. In Game of Thrones Season 8 Episode 1, Jon and Daenerys Targaryen decided to take the dragons for a ride. Once again, it looked like Jon wasn't ready to get on Drogon's back but it was evident that Rhaegal had taken a liking to him. When Dany gets on Drogon's back, Jon has several questions about riding a dragon but eventually climbs up on Rhaegal. The dragon immediately takes flight as soon as Jon is ready. It's an amazing scene but also one that might easily be explained by a passage in George R.R. Martin's novel A Dance with Dragons. In the book, Dany points out that no Targaryen has ever ridden two dragons. Although a dragon might have many riders since they easily outlive humans, a Targaryen always chose to ride one dragon in his or her lifetime. This could explain why Dany only rides Drogon. However, it could also confirm why Jon didn't get on Drogon's back in the episode Beyond The Wall in the seventh season. In the pivotal scene where his company is rescued by Daenerys, Jon hesitates to take her hand so he could get on Drogon's back. 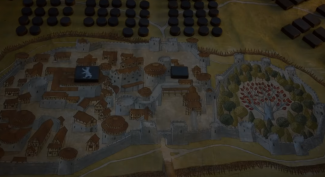 Instead, he turns back and stops the wights from attacking them. Could this be proof that Jon felt the Targaryen blood in him forcing him to stop from riding Drogon because he was destined to be Rhaegal's rider? This has yet to be confirmed but it's certainly plausible. 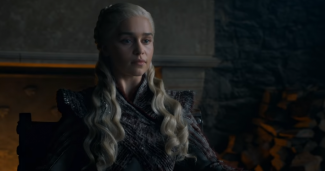 The second episode of Game of Thrones Season 8 will air on HBO on April 21.